The repetition of the final line, however, was drowned out by a thunderous applause. 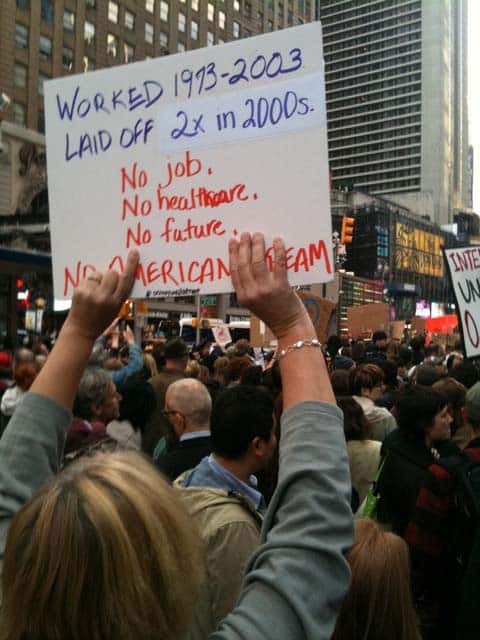 All throughout Times Square, workers joined in — some brandishing trade union-produced signs, others wielding handmade slogans on old cardboard or the back flap of pizza boxes, and yet many more “incognito,” there with only their bodies and their voices — as people across the globe took to the streets for the October 15th demonstrations. Initially it seemed lousy and immature to me when I saw the youngsters without any experience and knowledge of the social and labor movements . . . how can they dig out the real contradictions behind the superficial phenomenon? But then I’ve learned that even without crucial analysis of the society, what they complain and condemn is generally similar to what I, or the social and labor movements, do. They may not call themselves socialist, but the dissatisfaction and anger about the gap between the rich and the poor, the low wage, the unstable job, the connivance between the government and the enterprises, the less opportunity for the youth and the other disadvantaged groups, the harsh destruction of the natural environment, and their insistence on the nature of democracy and an open way of discussion and decision making, on the plans for open forums in the occupation, I see the seeds and fire of true modern-day socialism. And as I continue my conversations with trade unionists and labor activists around the world about what role the Occupy Wall Street movement is playing in their own working-class struggles, two central messages emerge: nearly everyone I speak with mentions both the historical centrality of the occupation tactic to trade union struggles of the past; and nearly everyone I speak with also hopes that this newly invigorated tactic of the Occupy Wall Street movement will inspire trade unionists — especially rank-and-file members — to revisit the occupation/sit-down strike technique. Labor historians and labor activists have, in recent years, devoted an increasing amount of attention to “occupy” tactics. From articles on the “Occupy. Resist. Produce.” politics of the MST in Brazil (see the interview with João Pedro Stedile’s in New Left Review) to the FaSinPat and Brukman workers and MTD activists in Argentina (documented in Marina Sitrin’s Horizontalism and Lavaca Collective’s Sin Patrón) to the recent leveraging of occupation tactics in Chicago’s Republic Windows and Doors factory (the subject of Kari Lydersen’s Revolt on Goose Island) and in the streets of Miami (analyzed in Max Rameua’s Take Back the Land), the global desire and need for leveraging occupation techniques from the local to global scale has been escalating in recent years. Last year, workers who were dismissed from Tekel, Turkey’s alcohol and tobacco monopoly, held protest demonstrations for weeks in the main square of Ankara. They occupied the main district of Ankara for 78 days, starting on 15 December 2009. It was workers who decided to occupy the streets on that occasion. They decided to stay there, they were alone but they demonstrated their persistence day by day for their cause. At the end they received support from the majority of society. Usually they have no interest in the protests if their members and their structure is not affected directly by an issue. Even if they decide to participate, it is not possible for them to mobilize their members since they have weak relationships with their members and do not have a strong social base. Perhaps in addition to marching in rallies and looking for ways to mobilize their members to participate in their local occupy movement, the lesson that U.S. and other less-than-progressive trade unions around the world should take from this moment is that the rank-and -file workers have been waiting for an opportunity to slow down, sit in, and sit down in their workplaces again. Workers, especially young workers here in the States and elsewhere around the world, are ready, once again, to participatein re-defining how their own workday lives are structured and lived. And this reinvigoration of an old tactic, in the end, could become — for the global working-class struggle — one of the most significant benefits of the #OWS movement. Mark Nowak is the author of Coal Mountain Elementary (Coffee House Press, 2009) and Shut Up Shut Down (Coffee House Press, 2004). Read his blog Coal Mountain at <coalmountain.wordpress.com>.